Donald Trump has publicly feuded with athletes in a way no president has before. Donald Trump has publicly feuded with athletes and sports institutions in a way that no U.S. president has before. From waging a constant campaign against the National Football League — a feud Trump ignited exactly one year ago — to his Twitter fights with some of the nation's top athletes, the president has repeatedly made himself a part of the sports story. And by doing so, he's shattered the myth that politics and sports don't mix. According to sports journalist Christine Brennan, Trump's criticism of players kneeling during the national anthem has elevated the issue to a national level, energized protests on and off the field and even prompted sports journalists and networks to cover politics and social justice issues more frequently. "I have never written more columns about a president or talked more on TV about a president in my life," Brennan, who has covered American sports since the presidency of Ronald Reagan, said. "What does that tell us? This president has entered the sports realm in a way that’s absolutely unprecedented." Ben Carrington, a professor of sociology and journalism at the University of Southern California, pointed out that sports have always been shaped by the fight for civil rights in America. Still, there was "this collective agreement" that we’re going to "naively believe that unlike any social institution, sports are moved from the messy and sometimes ugly terrain of politics," he told ABC News. "Inadvertently, Trump has been good at exposing the inherent connections with sports and politics that have always been there," Carrington said. "Trump makes those connections more explicit. To say that sports and politics don’t mix now seems the ridiculous position to hold." Over the last year, Trump reignited his feud with the NFL during interviews, campaign rallies, national addresses and a consistent stream of animated tweets, attacking the league and providing commentary on everything from the NFL's latest negotiations with players over the kneeling policy, to criticizing Nike's ad campaign starring Colin Kaepernick, the former San Francisco 49ers quarterback who in 2016 was the first to take a knee. (Jamie Squire/Getty Images, FILE) President Donald Trump on the field during the national anthem prior to the CFP National Championship presented by AT&T between the Georgia Bulldogs and the Alabama Crimson Tide at Mercedes-Benz Stadium in Atlanta, Jan. 8, 2018. 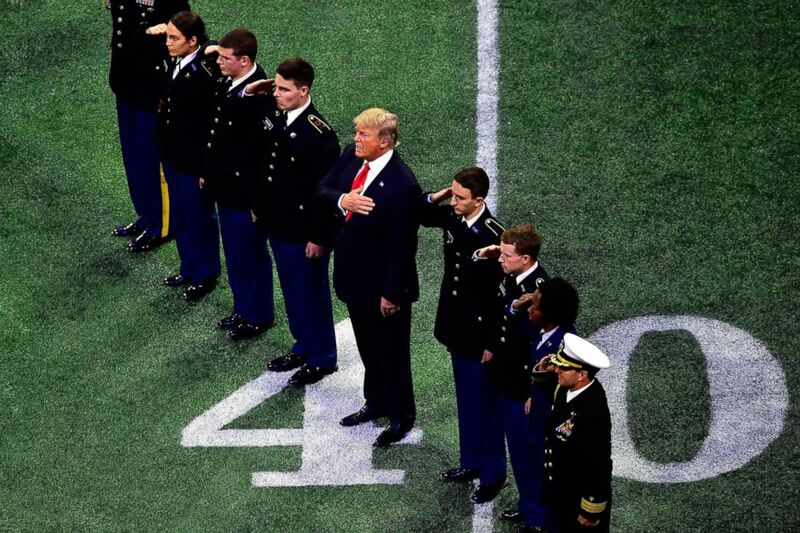 And in a show of patriotism, he joined members of the military on the football field in January for the National Anthem prior to the CFP National Championship. By repeatedly lambasting players, the president took sides and drew a line in the sand on an issue that has proven to be a contentious and divisive one for the country. He suggested that players who take a knee should leave the country, attacked the league for not firing them, slammed NFL ratings and even called on his supporters to boycott the NFL. But despite the president’s claims that NFL ratings are down, ratings have generally been up through the first two weeks of the schedule, according to The Associated Press. "Sports is both an escape and an important part of our culture. The difference [now] is we have a president who is using sports to divide us," Brennan said, echoing a claim made by NBA champion LeBron James, who has repeatedly feuded with the president. "If we look back on the Colin Kaepernick protests about racial inequality during the national anthem, that story had died down almost to nothing," Brennan said. She went on, "No one was talking about it, no one was writing about it. Colin Kaepernick was out of the league. He wasn’t doing interviews. It was over, the story was over. And then in September of 2017 Donald Trump said his infamous SOB line and that brought it all back. It was Donald Trump who brought that back for his purposes." At a campaign rally in Alabama on Sept. 22, 2017, Trump called on NFL owners to fire players who take a knee, suggesting they say "get that s-- of a b---- off the field! He's fired, he's fired!" The backlash against the president's comments, even from players and coaches who had not discussed the issue before, was swift. 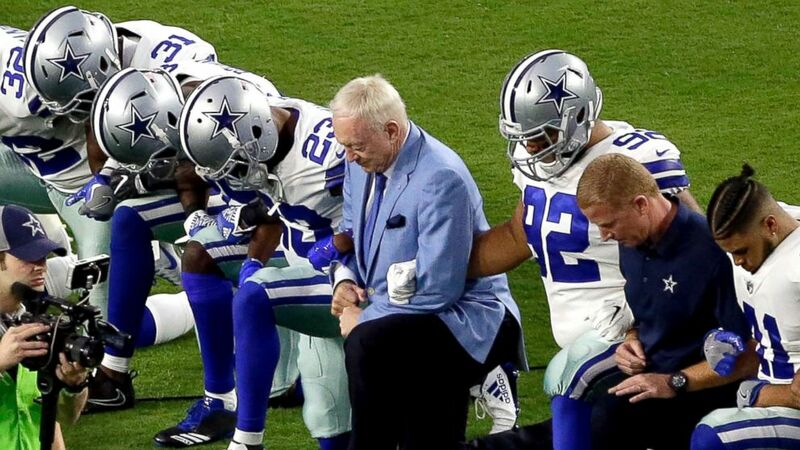 Players, coaches and owners have been seen locking arms and collectively taking a knee on the field in an unprecedented joint political statement that aired on national television. The NFL did not immediately respond to ABC News' request for comment. (Matt York/AP) The Dallas Cowboys, led by owner Jerry Jones, center, take a knee prior to the national anthem prior to an NFL football game against the Arizona Cardinals, Sept. 25, 2017, in Glendale, Ariz.
Carrington said that it was "Trump’s intervention that put this back on to the agenda" by "forcing some of those NFL players who were on the sidelines to say I need to take a stand and speak out more forcefully." Miami Dolphins wide receivers Kenny Stills and Albert Wilson became the first players to take a knee during the 2018 regular season on Sept. 9 and their statement was applauded by Kaepernick, Eric Reid and others who participated in the protests. “My Brothers @kstills and @ithinkisee12 continue to show their unwavering strength by fighting for the oppressed! They have not backed down, even when attacked and intimidated. 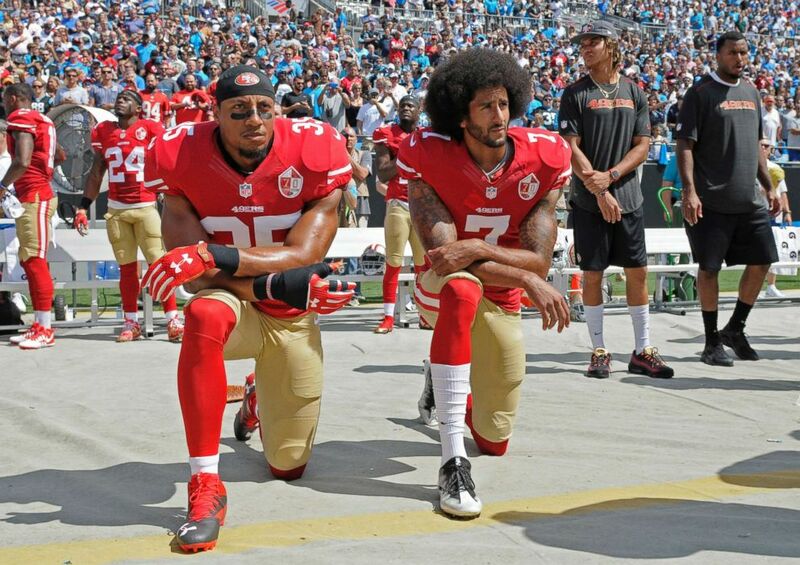 Their courage will move the world forward!” Kaepernick tweeted. Earlier this month the president denounced the NFL ahead of the first full day of the season, suggesting that if players "stood proudly" for the national anthem "ratings could come back." And last month, Trump argued that players who protest should be "suspended without pay." The social media age, which gave athletes a voice beyond the locker room, has already been chipping away at the notion that politics and sports don’t mix. Trump, however, has publicly shattered it. “There’s nothing new about athletes caring about social issues. The Brooklyn Dodgers cared when they signed Jackie Robinson … What is new is the president ginning all this up, goading everyone to do it and that is unprecedented,” Brennan said.